The Terrain composition nodes allow you to blend two terrains and apply a mask on two blended terrains to achieve a final result. Sum: This node sums two terrains. Difference: This node subtracts one terrain from another terrain. Average: This node calculates the average value between two terrains. Min: This node calculates the minimum value between two terrains. Max: This node calculates the maximum value between two terrains. Composition: This node creates a linear composition between two terrains. Full composition: This node gives maximum freedom to compose two terrains. The second terrain can be translated in the X and Y axis, scaled, and rotated before composing it with the first terrain. Sum using mask: This node adds one terrain to another terrain at the locations defined by a mask. Difference using mask: This node subtracts one terrain from another terrain at the locations defined by a mask. Average using mask: This node calculates the average between two terrains at the areas defined by a mask. Alpha-blend: This node creates an alpha composition between two terrains at locations defined by a mask. Composition using mask: This node creates a linear composition between two terrains at locations defined by a mask. 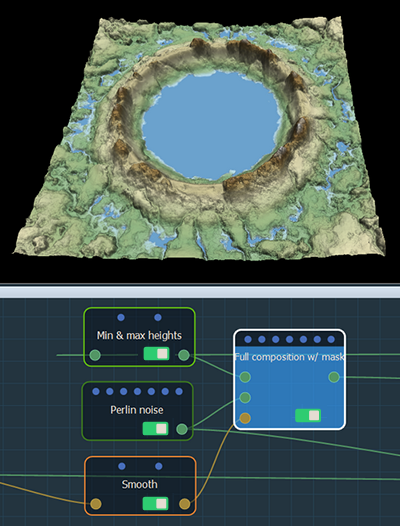 Full composition using mask: This node gives maximum freedom to compose two terrains using a mask applied to the second terrain.